Abstract: The Epox 9U1697 GLI motherboard that's passing through the PCSTATS test labs today is based on ULi's last chipset the M1697, which is no sleeper. ULi will be remembered as a value-oriented chipset manufacturer, which is a shame since the chipsets it released just before the company was scooped up by nVIDIA were pretty good and fast. In fact, ULi was just starting to get hot in the retail market with its extremely flexible chipsets that even overclocked well. nVIDIA has already proved itself several times and is definitely one of the market leaders when it comes to motherboard chipsets. Many new technologies and standards have been spearheaded by nVIDIA engineers, and with the acquisition of ULi it's now a very strong player. Perhaps nVIDIA will soon go after Intel chipsets... since nVIDIA has virtual iron grasp on the AMD front. There are many rumors on why nVIDIA decided to purchase ULi, the most entertaining one alleges that the company bought ULi to spite ATi. While that holds little weight, it's certainly funny to think of large corporations acting like children. ;-) nVIDIA has never come out with an explanation nor is it required to so, and thus the reasons remain speculation and probably forever will. The Epox 9U1697 GLI motherboard that's passing through the PCSTATS test labs today is based on ULi's last chipset which was quite a sleeper, the M1697. Make no mistake about it, the Epox 9U1697 GLI motherboard is inexpensive at just $85 CDN ($77 US, £41 GBP), but that doesn't mean it's a slow motherboard! The Epox 9U1697 GLI is a lean Socket 939 motherboard and supports all AMD Athlon64, X2 and FX processors (socket 939 models only). The four DDR RAM slots can accommodate up to 4GB of DDR400 memory. It's possible that the Athlon64 memory controller can handle more, but Epox says 4GB is the max. The only on board goodies which stand out from the standard feature set are a 10/100 NIC, a 5.1 channel audio controller, and Port 80 diagnostics card. With the money you save with the motherboard, go and get whatever peripherals you want and plug them into one of the three PCI slots or PCI Express x1 slot. Probably the first thing you'll notice are the two PCI Express x16 slots on this budget motherboard... with what looks like a set of SLi jumpers in between. 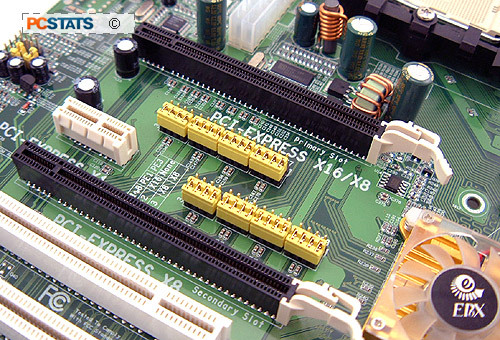 To split the PCI Express x16 bus equally between both slots, you'll have to move six sets of jumpers first. It would have been nice if the motherboard would automatically do that, but this is a budget board and a switchless feature would add to the cost. Now here is the tricky part - while there are two PCI Express x16 slots on the Epox 9U1697 GLI motherboard, they do not officially support nVIDIA SLI or ATi CrossFire. Dual videocards can be used for multiple 2D displays, like for workstation style applications - but that's it. Now that nVIDIA owns ULi, it's possible that it may eventually certify the ULi chipset as SLI compatible, but that is something you shouldn't bet on. If you decide you wanted to expand on things, there is an open PCI Express x1 slot for high bandwidth devices and three 32-bit PCI slots for older legacy hardware. External peripherals can also be connected via the four USB 2.0 slots on the rear I/O. The Epox 9U1697 GLI motherboard has an additional two USB headers for more ports, but no brackets are included in the box. 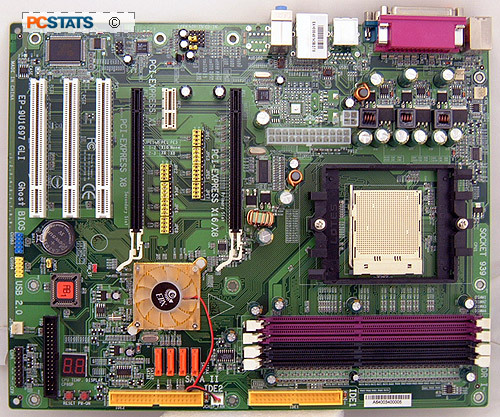 The Epox 9U1697 GLI motherboard has four Serial ATA slots II slots which support a maximum of four hard drives. If you want, it can also run in RAID mode 0, 1, 0+1 and 5. There are two parallel IDE slots for a maximum of four IDE devices, and these are great for optical drives or older hard drives. If you're going to be buying something new we'd suggest investing in Serial ATA hard drives as manufacturers are phasing out IDE this year. We did try running two GeForce 7800GTX videocards in 'GLI mode' with beta Forceware 91.27 drivers..... but that was a no go. It didn't matter whether the jumpers were set properly or not and we were unable to find the ULi SLI patch that's rumored to unlock SLI compatibility. 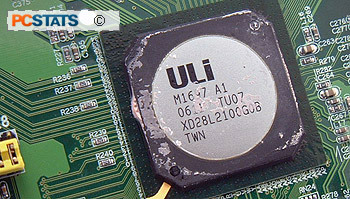 The ULi M1697 chipset supports both a 10/100 and Gigabit MAC, and it would have been nicer if Epox chose to go the Gigabit route instead. Gigabit networking is gaining huge popularity and the bandwidth increase really does make a difference. Equipping the 9U1697 GLI with a 10/100 NIC means you'll need to buy a separate Gigabit NIC for high network bandwidth needs. Epox also has an option on sound cards and chose to use a 5.1 channel audio controller instead of the High Definition 7.1 channel alternative. Next up, we take a look at the K8 ULi M1697 chipset and all it brings to the table!